Graphic novels are a great way to engage your children with reading. Books are portable, so your child can take his graphic novel virtually everywhere, making reading one of the best ways to spend leisure time. No longer just in comic book form, graphic novels are bound, durable, and full of substance. Many of today's graphic novels take comic books and collect them in a longer format for greater convenience. These books provide an addition to children's literature that entertains and engages the reader. 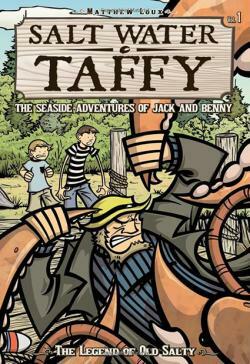 The Salt Water Taffy series by Matthew Loux is an adventure series about Jack and Benny, two brothers on summer vacation in the port town of Chowder Bay, Maine. What started out as a boring family trip turns into a fight against Old Salty, a lobster set on taking over the world. This series has received numerous favorable reviews and is included on the American Library Association's 2012 recommended collection of graphic novels. It's ideal for ages eight and up. 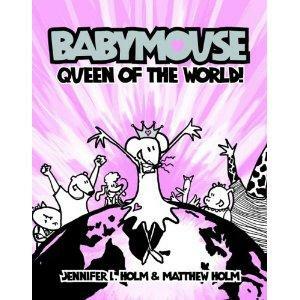 In the Eisner Award winning series, Babymouse, by Jennifer L Holm and Matthew Holm, Babymouse gets into all kinds of trouble. The stories are funny and reinforce smart choices. The series has more than eighteen books in total, and while it draws in female readers because of the character and the pink-tinted art, boys will also find fun in Babymouse's adventures. It's suggested for ages seven to ten. Julian is a science geek in The Secret Science Alliance and the Copycat Crook by Eleanor Davis. He is starting a new school and tries to fit in, but soon learns that being himself helps him to find friends who appreciate his intelligence. It is cool because his new friends also have a secret laboratory where they can invent all kinds of crazy new devices, and the situations they get into are a serious laugh. This stand-alone title won a Cybils award in 2009 and is suggested for ages eight to twelve. When five best friends go to camp for the summer, they never expected to be fighting three-eyed wolves or yeti. In Lumberjanes, these adventurous teenage girls are determined to have a blast, despite the supernatural monsters and bizarre quests set before them. Filled with fun and friendship, Lumberjanes is recommended for grades four and up. This series has received a GLAAD media award nomination and several favorable reviews. In this series, three cousins - Fone Bone, Phony Bone, and Smiley Bone - are driven away from home and swept into a fantasy adventure. This graphic novel is filled with dragons, royalty, and terrible evil, but all suffused with plenty of humor. Through its long-running history, Bone has won numerous Eisner and Harvey awards, and was even lauded in Time Magazine. The complete series of Bone is available in a single bound volume, recommended for ages nine and up. This eerie story by Neil Gaiman is an adaptation of his earlier award winning novella. Coraline tells the story of a young girl who has moved into a new house. She soon discovers a door that leads to an alternate reality, where Coraline finds everything she has ever wanted. However, the creatures on the other side have sinister motives and the "other mother" with button eyes doesn't want her to leave. When Coraline's parents are kidnapped into this alternate reality, she must confront aspects of childhood nightmares to bring them back. The graphic novel version of this story won a Locus Award in 2009. Ideal for the tween set from ages eight to twelve. This graphic novel was produced in commemoration of the 50th anniversary of the publication of Madeleine L'Engle's Newberry award-winning book. In A Wrinkle in Time, Meg Murry, her brother Charles, and friend Calvin O'Keefe use a device - the tesseract - to travel through space and time in search of Meg and Charles' missing father. They travel to other planets, fight against the Black Thing, and are aided by three supernatural beings - Mrs. Whatsit, Mrs. Who, and Mrs. Which. The graphic novel follows the original storyline closely and is suitable for ages 10 to 14. Like the original, the graphic novel has received favorable reviews and has made several recommended lists including, Booklist's Top 10 Graphic Novels for Youth and the YALSA List of Great Graphic Novels. In this retelling of the classic fairy tale, Rapunzel isn't content to stay in her tower and wait to be rescued by a prince. Instead, she uses her ridiculously long hair to enact her escape, spurns the prince, and teams up with Jack (of Beanstalk fame) to defeat her captor and rescue her real mother. Rapunzel's Revenge follows this plucky heroine in her adventures through a land with a Wild West flair, witty dialogue, and beautiful illustrations. This engaging tale has won or been nominated for several awards. For grades five and up. For a more classic version of fairy tales, Fairy Tale Comics is a great collection to have, bringing together seventeen stories from mainly European sources. Some Middle Eastern, Asian, and American tales also fill the pages and give the collection a good mix of better and lesser known lore. Each tale is illustrated by a different artist, and some have taken the basic story and placed it into an unexpected setting or used an unusual style. This collection of fairy tales has been recognized by several groups and made the School Library Journal's Top 10 Graphic Novel list in 2013. For ages six to twelve. This remake of the classic story by L. Frank Baum takes the story of Dorothy and her trip to Oz and portrays it with lavish full color illustrations. While most of us may be more familiar with the movie version of this story, the graphic novel follows the original book closely. This new vision of Oz won the Eisner Award for Best Limited Series or Story Arc in 2010. For preschool age and older. This graphic novel by renowned author Cory Doctorow and illustrator Jen Wang delves into the online world of massively-multiplayer online (MMO) gaming. Anda is a huge fan of Coarsegold Online where she plays heroic characters and meets friends from all over the world. When she meets a poor Chinese kid who is breaking the rules of the game to make a living in real life, Anda struggles with the ramifications of economics, poverty, and politics, beyond just gaming. In Real Life has been included in the 2015 YALSA Great Graphic Novels for Teens and Booklist Top 10 Graphic Novels for Youth lists. For ages 12 to 18. When Muslim-American teenager Kamala Khan sneaks out at night for a party, her biggest fear is getting caught by her parents. However, a strange gas cloud gives her super powers, and she struggles to control them while dealing with the cultural and social expectations put upon her by her family and others. The first installment of Ms. Marvel: No Normal gathers the first five issues of this in one volume. Ms. Marvel was nominated for the Dwayne McDuffie Award for Diversity and has been recognized by the MPAC Media Awards. Recommended for ages 13 to 17. While most graphic novels are compilations of a comic books series that have been put together into one volume at a later date, there is an emerging tendency for some chapter books to be illustrated - making them great options for the extremely reluctant reader. Raina is a happy sixth grader who suffers an unfortunate accident at Girl Scouts one night. Smile follows her struggle through multiple dental procedures and surgeries, while she also deals with teenage crushes, teasing, pranks, and all the social awkwardness that comes from adolescence. Smile has been promoted as an educational and entertaining graphic novel in both the Wall Street Journal and by the Comic Book Legal Defense Fund. Suitable for ages eight to twelve. In The Invention of Hugo Cabret, an orphan boy hides within a train station in Paris and tends to the clocks. His secret life is uncovered by an eccentric old man when Hugo steals pieces from the man's toy shop to try to repair the automaton left to him by his dead father. This fascinating graphic novel won the Caldecott Medal in 2007, has received numerous favorable reviews, and was even made into a movie. For ages eight to twelve. In this best-selling series of books, Greg Heffley is a wimpy middle school kid who struggles with the day-to-day problems of adolescence: school, friendship, bullies, and family. This humorous series has expanded to at least nine volumes, but first appeared as a free web comic. Diary of a Wimpy Kid won the Blue Peter award for the best children's book of the last 10 years and the Nickelodeon Kid's Choice Award for Favorite Book in 2011. Recommended for ages eight to thirteen. In a similar vein to Diary of a Wimpy Kid, Dork Diaries tells the story of Nikki Maxwell, an eighth grader starting a new school. With plenty of humor, the story follows Nikki through her struggles with new friends, a crush on the hot boy, fighting with her parents, and teenage embarrassments. This best-selling series won a 2015 NAACP Image Award for Outstanding Literary Work for children and has been highlighted in the New York Times. For ages nine to thirteen. Now is a great time to read for all ages, so grab one of the titles listed or take a family field trip to your library or bookstore. Begin your reading adventure with the best graphic novels for kids and enjoy.